For the second weekend in a row, protesters both for and against the immigration policy of Chancellor Angela Merkel’s government gathered in the eastern city of Chemnitz (formerly known as Karl-Marx-Stadt) to protest. The cause of the demonstrations was the murder of a 35-year old German by two young asylum seekers from Iraq and Syria during a city festival last Saturday. Whereas the numbers of extreme-left and far-right supporters surprised everyone last week, this time the 10,000 barrier was easily crossed as some 7,000 (according to police estimates) marched with the anti-immigration parties AfD and Pegida in a silent march whilst 5,000 left-wing organizations did the same in another part of the city. Police numbered several thousand as well, trying desperately to keep the groups separate, but by the time evening fell, the first skirmishes started. Antifa supporters had by then gathered bricks as the police rolled in the water-cannon trucks. Several were arrested. The AfD Supporters gathered for the start of their march at the Karl-Marx-Monument. They could be heard chanting: “Wir sind das Volk“ (we are the people) and “Merkel Muss Weg” (Merkel has to go). Among them were small groups of far-right protesters and neo-nazis. The international press was all around to see whether Germany would further descend into violence and rioting. 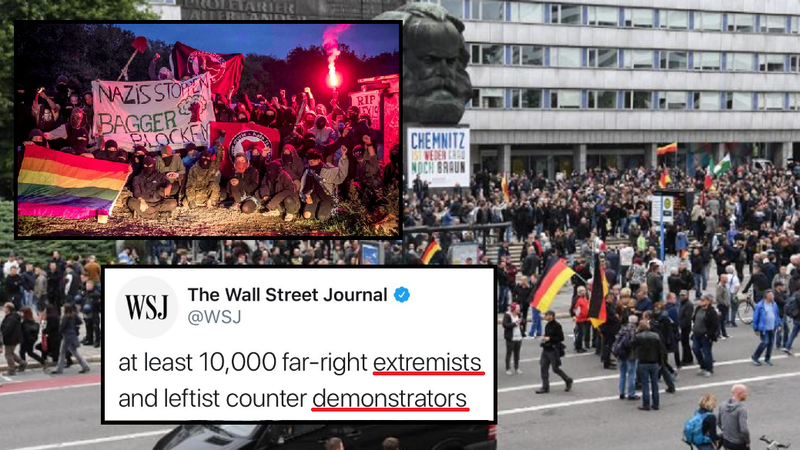 All international press made clear that those supporting the AfD were ‘extremists’ and those supporting the left were ‘demonstrators’ (thank you Wall Street Journal, at least that is now clear. Perhaps it is indeed better that you don’t carry a European printed version anymore although I do miss the editorials). The marches were broken up around 7.30 pm local time when small skirmishes started while police tried anxiously to keep the groups apart. It would be a long night ahead for Chemnitz. Germany has finally had enough. If not for our President, America would be doing the same. Watching the collapse of our west thanks to China! Go Neos!! We all could use a little Hitlering! We all could use a little Hitlering! wall street journal proving they are the enemy of the world again! it's inconceivable that anyone would actually support the savage invasion of their homeland. wow…. but the german people have been cucked with false guilt over the PHONY "holocaust". you see how the jews can destroy entire white countries simply by shaming them WITH LIES. notice that the fake new-news condemns the good German Nationalists as "extremists" and just love the violent Commie ANTIFA. JEWS DID 9/11 to get this nightmare rolling. Now the good german people must have another Nazi revolution and rout the jews, savages and ANTIFA into gas chambers but for-real this time. i'll volunteer my services….